As ministry leaders, we are constantly in the limelight. Our service is often very public, receiving praise and acknowledgement from those around us. Every week, everyone sees what we do. They see the way we lead our teams. They see us cast vision and implement systems. They know we hold significant leadership positions in the church. Sure, they may not fully understand what it looks like to wake up when it’s still dark on a Sunday morning to get to church with a smile on our face. But they know who we are and that we serve our church. I was struck by this as I led worship at a church about month ago. The service wrapped up and the pastor ascended the platform to dismiss the congregation. He thanked me publicly as the worship leader and the congregation clapped in response. Everyone was dismissed and I gathered my guitar, cables, pedals, etc., checked to make sure the stage was cleared, and began to walk out the door. I turned and nearly bumped into the person gathering used communion cups. There was a team of 5 people breaking down chairs and setting up tables for an upcoming event. The crew in foyer were cleaning dirty coffee pots and the nursery team (who had been their equally as long as me) sat on the floor scrubbing toys with disinfectant. Every one of these people worked incredibly hard and sacrificially, but none of them received a public thank you. It made me think: where am I serving “thanklessly” in my life right now? As a worship leader, it’s sometimes easy to think that because my job is service-oriented and at church, I’m excused from finding other areas to serve. However, God calls us to humble ourselves and to serve in the shadows. Though we may not receive a thank you on the other side, we are refined through the process. Jesus had a very public ministry on earth. He fed the five thousand, performed jaw-dropping miracles, and shared the gospel from a platform that brought thousands to hear what he had to say. Yet, at the same time, He was humble. He met the woman at the well and heard her story. He washed the disciples feet. He befriended and dined with those everyone else hated. He humbled himself and gave the ultimate sacrifice as he hung upon the cross. As women who have been called to lead, I wonder: how can we imitate Christ’s humility by finding places to serve and love on people in anonymous, “thankless” ways? Maybe you need to find an outlet for service outside of your church, where people don’t know you. Or, perhaps you need to use the platform you’ve been given at your church to mentor one of the younger girls who looks up to you. Perhaps you are a mom and your thankless service is changing a million diapers a day and making nightly dinners. Whatever that humble service is for you, know that God is glorified through the works of your hands. How do you find ways to serve, outside of your primary ministry role? 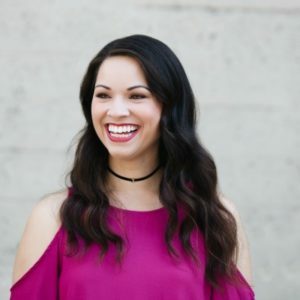 Linzy is a singer/songwriter and worship leader in the San Francisco Bay Area. 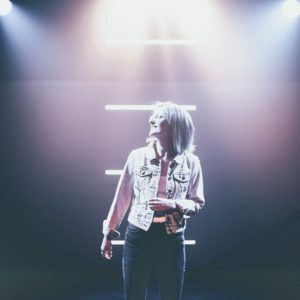 She leads worship at various churches, conferences, and retreats around the country and is passionate about creating music that helps people connect with the heart of God. Linzy desperately wants to see God’s name lifted high in this hurting world and to help others recognize that it is because of Him we can fight for joy and healing. Her solo EP, Here in the Waiting, was released in July of 2015, shortly following her single entitled “I Surrender All to Thee.” When she’s not doing ministry, you will find her hiking, drinking coffee, or exploring new places with her hubby Dan and their sidekick (son) Peyton. HOW MANY YEARS SHE’S ATTENDED SHE RISES CONFERENCE: More than 10! 3 WORDS TO DESCRIBE CONFERENCE: Joyful, encouraging, inspiring. WHY SHE KEEPS ATTENDING: I attend the conference because it’s my annual infusion of inspiration and encouragement sprinkled with awesome worship and a large dose of estrogen. In a room that large with THAT many women – there is nothing better! HER FAVORITE CONFERENCE MOMENT: There is not one favorite moment for me but the overall feeling I get each year when God’s spirit is unleashed and swirling around the room full of women knowing that many will be blessed and spurred on in their journey. You can feel the freedom of many being supported, encouraged, having chains broken, feeling loved on and glowing with utter joy all around. 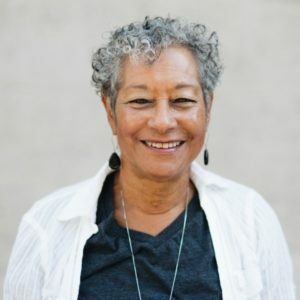 WHAT SHE WOULD SAY TO SOMEONE CONSIDERING ATTENDING CONFERENCE: I often invite many of my friends each year to attend and I simply tell them they need their soul fed and this is the place to do it. It’s safe and full of joy and love and care and kindness and they will walk away feeling stronger and more affirmed in their journey. Most women are exhausted in their day to day lives and this conference is the thing they all need to feel renewed and refreshed. It’s church 2.0 full of dynamic women! HER STORY: Walking my unique journey as a single “maternal” woman, God has used my singleness over the years to be a blessing to others. I’m the nurturer to many and am so thankful that God can use me in this way to support, love and care for others around me. I can use my time well to infuse others with encouragement as well as meet needs when situations arise. I have found that using my life in this way satisfies my maternal needs as well as keeps my heart content in my own journey. God has taught me to love my tribe well and in doing so, I feel loved by God in extraordinary ways. Have you ever shared an experience with someone, and then discovered that they remember it completely differently than you? My husband and I frequently – and often to each other’s amazement – recall the details of events with significant variation. We find ourselves laughing, astonished that we’re living such different realities! I’m reminded in those moments, that perspective is shaping our stories. My perspective can move me from frustration to freedom, from self-pity to victory… even when nothing around me has changed! So many times I’ve felt aggravated by a “first-world problem” – until I remember that most of the world is dreaming of having my problems. Perspective is one of the biggest deciding factors of our contentment and happiness. It’s what helps us “let the peace of Christ rule in our hearts” (Colossians 3:15). Did you catch that? She says that simply being grateful can shift our perspective on life dramatically. And in my experience, God has shown me over and over again that it’s true. Let’s make it our aim to cultivate gratitude on the daily. If we water seeds of thankfulness in our hearts, its fruit will likely grow to overtake our discontent. Romans 12 tells us we can be transformed if our minds are renewed. 1 Corinthians 2 lets us know that we now have the mind of Christ. Psalm 119 suggests that if we walk on a path of obedience to God’s Word, we’ll discover delight. To me, that sounds a lot like “taking every thought captive” (2 Corinthians 10)! Only when we’re studying the Word of God and applying it to our lives, can we have a right and grateful perspective. So many messages bombard us every day. We NEED the Bible to shape and guide us, or all those other messages are going to vie for influence on our point of view. The Word of God is so freeing, so alive, and so beautiful; let’s dive in daily to its depths, and let God shape our world-view in the coolest way ever: by revealing His. Impure motives give discontent a leg to stand on. Want to drain your gratitude fast? Try idolizing recognition, worldly success, or fame. Try giving in to a selfish motive. But if your goal is gratitude, then make sure you’re constantly separating your calling from your fleshly wants. We were all made for greatness – and with it humility, purity, and grace. But if a selfish motivation creeps in, attempting to disguise itself as greatness, our gratitude will leak; because contentment can’t co-exist with greed. How amazing would it be if we filled the Church with constant appreciation! Let’s look for opportunities to speak gratitude to those around us; that kind of thing can elevate someone’s week. There are also SO many things we can tell God “thank You” for. My guess is, if I attempted all of mine in one day, I’d run out of sunlight with a long list still to go. I’m sure you feel the same way. Let’s dwell on His goodness – I know we won’t regret it. What’s one way gratitude has changed your perspective lately? 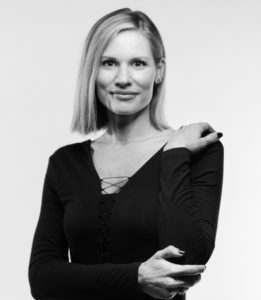 Andrea Hamilton Binley has written music for over 30 TV shows and has performed around the globe as an artist rep for Project AK-47. Andrea is a worship leader at Inland Hills Church in Chino, CA, and a lead singer in the upbeat, synth worship band Binley. The band’s first single, “No Other,” is out now. HOW MANY YEARS SHE’S ATTENDED SHE RISES CONFERENCE: I’ve attended every one! 3 WORDS TO DESCRIBE CONFERENCE: Encouraging, uplifting, life changing. WHY SHE KEEPS ATTENDING: To enhance my faith in Christ and my relationships with others. HER FAVORITE CONFERENCE MOMENT: One of the first conferences, we dressed up as warrior chicks. I came to the conference in combat boots, shield, and sword. It was so fun! I was reminded that I need to equip myself with my spiritual armor. WHAT SHE WOULD SAY TO SOMEONE CONSIDERING ATTENDING CONFERENCE: I would tell her to make every effort to come. The experience will be enjoyable and a boost of confidence as we navigate our daily life. HER STORY: I was abandoned at birth raised in foster care until 14. At 14, a county welfare worker escorted me along with 2 paper bags of my belongings to live with my mother. This was my first time meeting her and our relationship was not healthy. I met my father at 16 and we had a good relationship. At 22, I moved to California. At 23, I became a single mom to a beautiful baby girl and ended up getting involved in transcendental meditation. I had extremely low self esteem, hated myself, and harbored unforgiveness. In my 40’s, I accepted Jesus as my Savior. 31 years ago I came to Oasis. At 77, years old I am not abandoned. I know who I am and whose I am. I am adopted into God’s family and I am unconditionally loved. I realize this isn’t the most popular opinion, but I hold it unwaveringly and nobody can convince me otherwise. Fall is my favorite season (sorry summer lovers)! As a mother of three elementary and middle school kiddos, fall is a time to celebrate. Everyone is back in school and our routines are as established as they ever will be. The air is crisp. The leaves are changing; fall is a beautiful thing. As I write this I have a pumpkin chai candle burning and a vase full of fall colored flowers. Overboard? Maybe. But I do it all in anticipation for the best part of the season: Thanksgiving! Thanksgiving is a holiday without the distractions of gifts or elaborate decorations. We literally sit around with our family and take a few precious moments to contemplate what we are grateful for. Gratitude makes us stop thinking about what is wrong or insufficient in our lives and allows us to focus on what is right and fulfilling. Could you imagine what our lives would look like if we choose to live every day with gratitude? What would happen if we focused daily on the sufficiency of our relationships, finances and ourselves instead of our insufficiencies? That’s what gratitude does for us. I bet we all want to live with more gratitude every day. So, why don’t we? If we live in a state of godliness with contentment our mentality shifts, and even though we may not have more of anything, what we have will be enough. This is why having those two things make us very wealthy. Godliness with contentment. Godliness convinces us that we are enough and contentment convinces us that what we have is enough. Do you consider yourself godly? Why or why not? Did you perform godly acts yesterday so you’re feeling especially godly today? Or did you yell at your coworkers, kids and best friend all in one day yesterday so there’s no way you could be godly today? Here is what I learned that changed my life when I desperately needed it. My godliness isn’t based at all on my actions or performance. I am godly simply because I have chosen to believe in Jesus and His righteousness. The Bible says, “For He made Him [Jesus] who knew no sin to be sin for us, that we might become the righteousness of God in Him.” (2 Corinthians 5:21, NKJV). Jesus took all our wrong upon Himself and gave us all His rightness, perfection, and godliness. I cannot do a single thing to become more godly, because I can’t become anymore godly than Jesus already made me. I desperately needed this nine years ago when I was feeling completely inadequate. My husband Judah and I had been working as the youth pastors at the church his parents had founded and were leading. After Judah’s father was diagnosed with terminal cancer and was no longer able to lead the church, Judah’s parents asked us to step in as Lead Pastors. I honestly didn’t think I could do it! I had two young boys and was pregnant with our baby girl. I had been used to leading teenagers but adults scared me. I was intimidated and felt completely unable to handle that weight of responsibility. Looking in the mirror and telling myself I was qualified didn’t help. Telling myself I could do it didn’t help. The realization that I am complete and enough through Jesus was the only thing that enabled me to know that what I am is enough. We are enough because Jesus has made us enough. He made us godly. We are enough. Once we believe we are enough, it’s easy to be content that what we have is enough. Sure, we may not have as much as we want to have, or as much as our friend has, but once we realize we are enough we no longer need those things to make us feel adequate. As 1 Timothy says, if we have food and clothing, let it be enough. A lot of days we have to fight for this mentality and remind ourselves of it. But if we enter this month truly content, gratitude will easily follow. 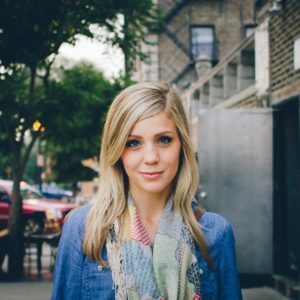 Chelsea Smith is the co-lead pastor of Churchome, formerly The City Church, in Seattle, Washington. 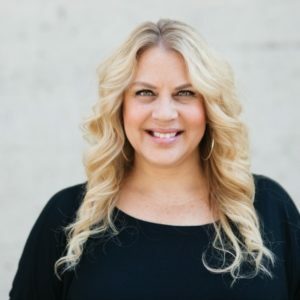 She and her husband, Judah Smith, lead a thriving multi-site congregation with campuses throughout the greater Seattle area, Beverly Hills and Guadalajara, Mexico. She is a gifted leader and speaker who is passionate about showing the world who Jesus is. Her ministry is noted for down-to-earth wisdom, authenticity, humor, and strong faith. Judah and Chelsea have three children: Zion, Eliott, and Grace. 3 WORDS TO DESCRIBE CONFERENCE: Empowering, refreshing, inspiring. WHY SHE KEEPS ATTENDING: I attend She Rises because it is a beautiful, empowering and truly transformative experience to worship God in unity with other women, and to receive wisdom tailored specifically for the most feminine aspects of our identities as daughters. I always walk away grateful to have learned from the leaders that have gone before me and knowing that I’m not alone but a part of a flourishing community of like-minded, Jesus-loving, revolutionary women! HER FAVORITE CONFERENCE MOMENT: I’ll never forget when Holly brought her daughter, Paris, on stage at She Rises in 2015, wrapped her arms around her and demonstrated our duty to teach, empower and encourage the generation of women that comes behind us. It was as if she literally clothed her with strength and dignity using Scripture and her loving presence as her mother and leader. It was a beautiful and powerful moment and I walked away with a new understanding of our ability through God to have an eternal impact through a legacy of love. 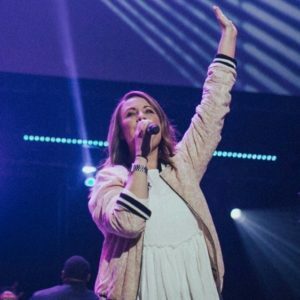 WHAT SHE WOULD SAY TO SOMEONE CONSIDERING ATTENDING CONFERENCE: She Rises is a one-of-a-kind, carefully designed atmosphere that is crafted just for you to experience God’s love uniquely as His daughter and in unity with thousands of other women! It’s a few days to forget your to-do list, have fun, remember who you are, learn, dance & worship, but especially for you to encounter God in a new way. You will leave refreshed and empowered in your purpose and identity to walk confidently back into your world, with an incredible group of women coming alongside you. HER STORY: I spent most of my life building up deep and high walls around my heart to try to protect myself from experiencing any more hurt and abandonment from people. Until recently, my heart was almost fully imprisoned within my walls and I believed that I was unlovable at my core. Those walls trapped me in my pain, made me feel empty and broken, lead me to hurt others and kept me from receiving love in a healthy way. I hid behind a bubbly, sweet, performance-based exterior. It wasn’t until a year ago that I finally surrendered control of the walls to God in my brokenness. He began to help me knock them down, brick by brick and over time I more fully experienced his love through relationship as he transformed my heart and mind. I now know and believe the truth that I am known, protected, treasured and loved by God for who I am in Christ. Through His unconditional love and redemptive grace, He has freed me to walk confidently alongside Him according to His purpose and plan for my life as His beloved daughter, and to love and be a light to others with Him as my source. Have you ever had a random moment in your day when a smell catches you off guard? And just for a second, it immediately transports you back to a very specific memory or moment in your life? Well, I had one of those moments happen to me the other day. My husband’s car was in the shop and so our mechanic let us borrow a loaner car until the work on ours was done. This was a very old, very beat up, VERY smelly car. Being the good wife that I am, I decided to let my husband use my car to commute to work and I begrudginly graciously took the loaner car. I went to the gym and after a grueling 45 minute bike ride while watching the latest episode of “This Is Us” (yes, I multitask while I work out…please don’t judge) I walked back to my loaner car. When I opened the door, I noticed an open tube of used red lipstick sitting in the cup holder that was begging me to try it on. Alas, it also had dirt flakes on it that begged even louder for me to throw it away. As I sat down I was engulfed by a smell…a very familiar smell…a mix of old crayons and exhaust fumes. It was…the smell of an old car. Growing up, my family could not afford new cars so we bought older, slightly used ones that my dad could fix when they broke down. We went through at least 10 cars from when I was in kindergarten til I graduated. And they all had one thing in common…they smelled the same…like old crayons and exhaust fumes. So you can imagine that the overwhelming smell in that loaner car immediately brought me back to countless car rides growing up. And out of nowhere, my eyes welled up with tears and these words quietly came out of my mouth…”Thank you Jesus”. If I’m honest, my initial thought was “thank you Jesus that I don’t have to drive cars like this anymore”. That quickly changed to “thank you Jesus for the cars you’ve blessed me with that get me from point A to point B without breaking down”. And then it happened…I started remembering. I remembered the bed in the backseat my mom would make for me so I could keep sleeping whenever we picked up my dad from work in the middle of the night. I remembered our road trips from Seattle to Portland to visit my grandparents and the hundreds of times we played the slug bug and license plate game. I remembered early mornings praying that the car would turn on and get us to school on time. I remembered the multiple times ALL of our cars broke down and my dad would be outside in the pouring rain fixing it one more time even though he just got home from working a 4 day trip as a flight attendant. My “thank you Jesus” kept evolving as I remembered all the good things that came from driving in those old, beat up, smelly cars. I learned what family looked like from those cars. I found my love for adventure and games in those cars. I learned how to pray and watched them get answered in those cars. I learned what hard work and sacrifice was from those cars. And now, years later, I was learning about thankfulness from those cars. I don’t know about you, but when it comes to thankfulness, I am a lot like newer cars. I’m a Point A to at Point B person. I’m thankful at the beginning of something and I’m thankful when I’ve reached my destination. But somewhere during the trip, my thankfulness usually gets lost. Lamentations 3:20-23 says “I will never forget this awful time, as I grieve over my loss. Yet I still dare to hope when I remember this: The faithful love of the LORD never ends! His mercies never cease. Great is his faithfulness; his mercies begin afresh each morning. Just reading that verse makes me thankful! There’s something about remembering what God has done in our lives, especially during hard situations that make being thankful a lot easier. I know that happened for me while I was sitting in that car smelling all the smells. When I really thought about it, I saw how God has consistently turned soooo many hard seasons and situations in my life into good things. And the more I remembered what he’s done, the easier it was to be thankful. It also made me worry less about what will happen between Point A and Point B in some situations that are currently happening in my life. I began to feel hopeful again about how they’ll turn out. I was reminded of something Joyce Meyer often says…“You may not be where you wanna be, but thank God you’re not where you used to be”. I think as we make the daily choice to remember how far God has brought us DURING whatever we’re in, we’ll be surprised at how quickly thankfulness comes and our hope is renewed. So…let’s start together…right now…while we’re staring at our computers or sitting in our cars or working out at the gym…and pause. Go back to a memory or a moment and allow it to reignite thankfulness in the middle of the journey. Amy Luna is originally from Seattle, WA but has lived in LA for over 10 years. She’s been a part of the Oasis Worship team for almost a decade and is an Associate Pastor at Oasis Church. Amy loves music, hiking, the rain and being married for the last 2 years to her amazing husband Nelson Luna.